The methods of leaving the physical body are varied, and different methods work for different individuals based on the person's temperament. The ones below have worked for myself to different degrees. However, it is important to be creative and feel comfortable with the method used. The most important thing is to get interested in the technique and play with it. Play is characterized by relaxed creativity and concentration. This can be done in disciplined meditation or while lying in bed as in the example where one is involved in designing something using the imagination as one drops off to sleep. Generally, the thing to avoid is tension and struggle since this usually rivets the soul to the body. Maintaining a strong sense of expectation during the day that one is capable of leaving the body or waking up in a dream is helpful. One way to maintain this sense of expectation is to use a common method developed by Stephen LaBerge. Here the person asks him or herself multiple times throughout the day if they are dreaming while looking for subtle clues in the environment that might indicate that they are in a dream state. Since what we dream sometimes echoes our concerns and activities in daily life, the question is likely to recur in the dream state. Repeating this question and its associated analysis in a dream will often times transform a normal dream into a lucid dream. It also helps to get extra sleep since it seems that most individuals require a certain amount of time to dream in a normal or semi-conscious fashion in order to purify the unconscious and process the day's events. Getting additional sleep beyond the minimum required makes additional time for more conscious or lucid dreaming to occur. This is why some people will set an alarm to wake themselves up in the early morning and then meditate back into sleep in an effort to have a spiritual travel experience (rather than doing the exercise when going to bed at night). Their refreshed state which is partly the result of having had time to experience normal dreaming during the night leaves them more open to having a lucid dream in the early morning. It is also important to remember that seeking out-of-body experience is part of a spiritual search and a stepping stone to spiritual awareness. Therefore any religious activity or practice which sharpens awareness and draws the attention away from material goals or objects such as meditation, prayer, devotion, service to others, going to church, mosque, or temple, reading spiritual books, or doing yoga will improve the probability of having a spiritual travel experience. Doing practices that are intended to induce out-of-body experience are meant to supplement other more conventional spiritual practices. The time and effort spent doing such practices can be very worthwhile because having out-of-body experiences can provide vivid evidence of a spiritual or supernatural world that is distinct from the physical world. Personal experience is many times more convincing than relying on the experiences of others. Such experience can therefore serve as a counterweight to the overwhelming materialism of the present age. We discuss some challenges to the problem of materialism on the page Challenging the Materialists . An interest in spiritual travel experience need not be the primary focus of one's spiritual path. 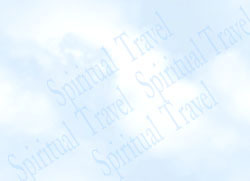 As mentioned in the introduction, spiritual travel is a tool for the spiritual seeker. Efforts to induce spiritual travel experience can be an important component of a larger set of spiritual practices because having just a few spiritual travel experiences can provide a powerful justification for living a spiritual life and added motivation for adopting a regular spiritual practice. There can be a synergy between spiritual travel practices and more traditional religious activities where each supports and reinforces the other. Spiritual travel also makes the spiritual quest into a dynamic, interesting, and adventuresome process that helps overcome the dullness and repetition that can be associated with both traditional religious ritual and many secular activities. The following practices are generic in the sense that they belong to no one religious tradition. However, they allow the practitioner to do religious practices once they have attained an out-of-body state where such practices can produce deep and powerful religious experiences. Awareness of the Inner Blue Light can be an Invitation to do Spiritual Travel.